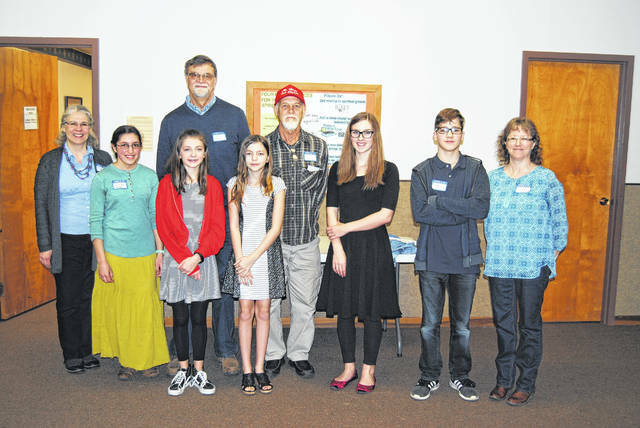 The Classical Conversations home-school community held a science fair at Grace Lutheran Church in Eaton on Jan. 27, 2018. EATON — The Classical Conversations home school community held a science fair at Grace Lutheran Church in Eaton on Jan. 27. Five students presented projects, which covered a wide variety of student interests, including: the quantity of electrolytes in various beverages (Stephen McNabb), uses for hydrogen peroxide (Hannah Ashworth), best methods for shuffling playing cards (Rebekah Honaker), best methods for melting ice (Miriam McNabb), and the physics of roller coasters (Madeleine Smith). After judges evaluated projects, friends and family were invited to see projects and ask students questions. Classical conversations would like to thank their judges for the day, Tom Barnes and Don Harsh, and Grace Lutheran Church. https://www.registerherald.com/wp-content/uploads/sites/41/2018/02/web1_DSC_0092.jpgThe Classical Conversations home-school community held a science fair at Grace Lutheran Church in Eaton on Jan. 27, 2018.